There are many simple things you can do to stay safe while paddling. Start by putting your name and contact information in or on your boat in a way that easily can be seen. This will aid in tracking down a boat that has gone missing, on or off the water. Carry waterproof ID with emergency contact information that can ride along with you in your pocket or in your boat. Follow these safety precautions when paddling on the canals. Be ready for unexpected circumstances and always wear a personal flotation device (PFD). The U.S. Coast Guard requires a PFD for each person on board. 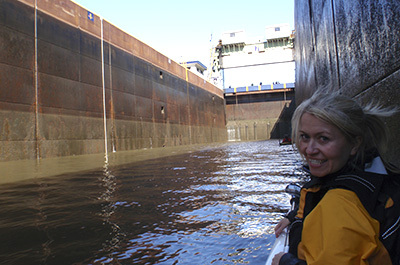 Canal regulations require that the PFD be worn when passing through a lock. 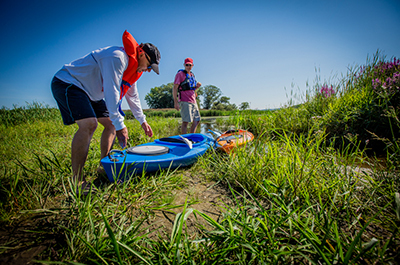 Familiarize yourself with potential hazards in the location you intend to paddle. These may include: dams, spillways, hydroelectric facilities, high water levels, and the wakes of motorized vessels. Consult the NYS Water Trail Guidebook and official NOAA charts for known locations of hazards before heading out. Be careful around dams. 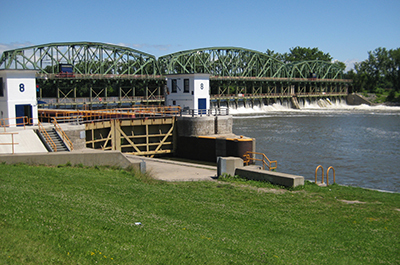 The movable dams in the Mohawk River are easy to spot from a distance. Low fixed dams can be hard to see when approaching from upstream. Most dams have a line of round orange buoys upstream. NEVER go below the markers. Be careful after floods; the safety booms sometimes get displaced. Know your skill level. 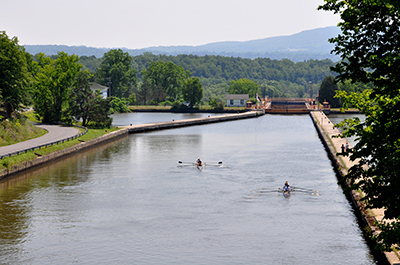 The canal system presents opportunities suited to beginners through advanced paddlers. Novices and families with children will find protected sections of the dug canal with flat water, particularly from Tonawanda to Lyons and along the Cayuga-Seneca Canal. More experience is needed to paddle river and lake sections where currents and wind affect conditions on the water. Plan your destination and time on the water according to your skills. Take extra precaution if paddling during colder weather. Cold-water immersion can quickly lead to hypothermia. Have dry clothing waiting for you in the car and, if you are going a long distance, take dry clothing on board in a waterproof bag. 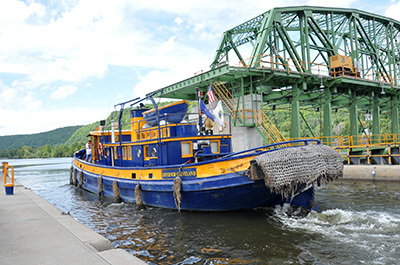 Check the NYS Canal Corporation "Notices and Alerts" before heading out. 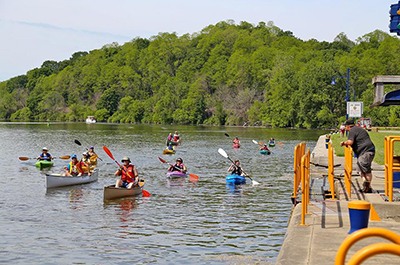 You'll find current information about the segment you plan to paddle, including openings/closures, water levels, construction, and other elements affecting navigation. A float plan will help to ensure your safety should something unexpected arise during your trip. Leave the information with a reliable person who will notify the authorities if you do not return as scheduled. If you are delayed and it is not an emergency, inform the person with your float plan to avoid an unnecessary search. Let the person know when you arrive home. Some areas of the canals have poor, or no, cellular signal reception. This could affect access to 911 emergency services or other communication needs. Most canal facilities and other private businesses do have landlines should you find limited cellular service during your journey.